Mixing is a systematically controlled random process. The aim of any mixing process is to unite a number of raw materials with diverse properties to a single substance with consistent characteristics. In mechanized mixing processes, the source materials are subjected to targeted acceleration and set into motion relative to each other. The direction and intensity of the individual movements should be as varied as possible. Consistently high levels of homogeneity can thus be reliably achieved after short mixing times. Additional aspects are gentle processing of the mixture and high energetic efficiency. It is particularly easy for these goals to be attained with the three-dimensional motion process used by mixers. Mixing processes can be performed in batch or continuous mode. With a continuous process, the particular challenge is to continuously weigh the individual mixing components precisely in accordance with the formula. 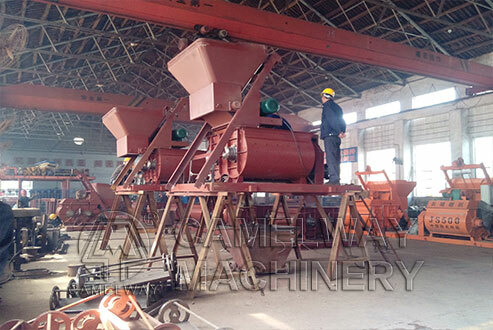 In addition, the desired homogeneity must be reliably achieved within a given short mixing time.Such as: The counter-rotating motion of the two mixing shafts as well as the inclined position of the mixing tools ensure an intense vertical and horizontal 3D mixing motion. The material that hardens on the trough walls provides protection against wear. We also offer wear-resistant liners made of chrome-chilled cast-iron tiles or, as an alternative, a rubber trough. This machine features excellent resistance to wear, easy maintenance and outstanding energy efficiency. For more information,welcome to contact us.